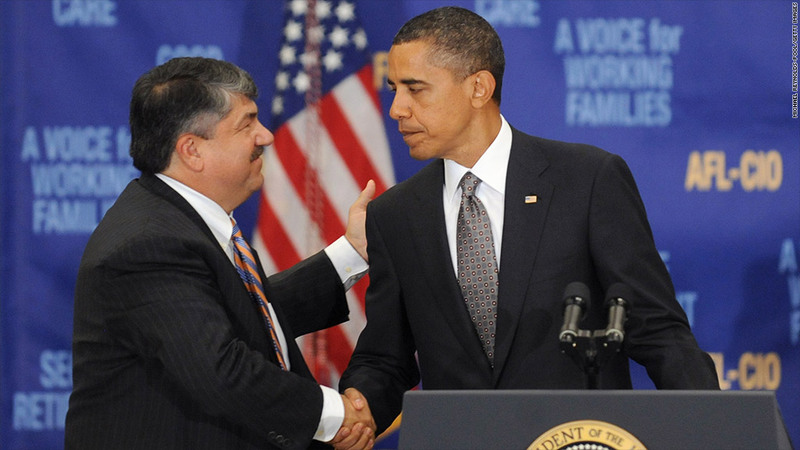 AFL-CIO chief Richard Trumka is among labor leaders headed to the White House on Tuesday. A cadre of top labor leaders is headed to the White House on Tuesday to press their concerns about the fiscal cliff. The fiscal cliff is the most pressing issue facing the President, who won reelection last week. If Congress doesn't act in the next seven weeks, it will deliver a one-two punch that will knock down the economy as it takes down hundreds of jobs and increases taxes for millions of Americans. At the end of this year, the George W. Bush-era tax cuts are set to expire, and on Jan. 2, automatic spending cuts will commence that amount to $1.2 trillion in deficit reduction over 10 years. Labor leaders want to make sure Obama makes good on his promise to raise taxes for households making more than $200,000 a year, or $250,000 if married, by allowing those tax cuts to lapse and bringing in some revenue via that route. "Clearly there was a mandate from this election, the American people are with the president on taxing the wealthiest Americans," said Peter Colavito, director of government affairs for Service Employees International Union, which represents 1.8 million workers, including nurses, janitors and security officers. "Our people expect leaders in both parties to honor that mandate and ask everyone to pay their fair share of taxes." In the meeting with President Obama are: The American Federation of Labor and Congress of Industrial Organizations (AFL-CIO) President Richard Trumka, Service Employees International Union (SEIU) President Mary Kay Henry, American Federation of State, County and Municipal Employees, (AFSCME) President Lee Saunders and National Education Association President Dennis Van Roekel, among others. Labor groups will also push the White House on another hot button issue: hiring teachers and improving public schools. They also want the government to focus on job growth by spending on infrastructure projects, building roads and bridges . It's controversial because such spending is not popular among conservative Republicans who dismiss the 2009 economic stimulus package as ineffective policy that added to federal deficits. "While our economy is still struggling, we urge you to prioritize job creation and economic growth in any agreement adopted," said a coalition of 145 labor and progressive groups in a letter to the president sent last Friday. "It must include steps to spur private investment and to create targeted investments in infrastructure and education that will grow the economy and create quality jobs." The SEIU and the AFL-CIO said the leaders will urge the President to keep the safety net intact for low income families and oppose any cuts to Medicare, Medicaid, Social Security benefits or shifting costs to the states. On Wednesday, the White House will hold a separate meeting with business leaders to talk about the fiscal cliff. American Express (AXP) CEO Kenneth Chenault and General Electric (GE) CEO Jeffrey Immelt will attend that meeting. The White House declined to respond to questions on who was invited to either meeting.